Share the post "Fibroids Do Not Always Require Uterus Removal"
UFE or uterine artery embolization (UAE) is a non-surgical treatment alternative to hysterectomy that takes less than one hour to complete. First performed in 1994, more than 50,000 women worldwide have been treated with the procedure. UFE or uterine artery embolization (UAE) is a non-surgical treatment alternative to hysterectomy that takes less than one hour to complete. First performed in 1994, more than 50,000 women worldwide have been treated with the procedure. Clinical studies have shown that UFE provides substantial improvement in major symptoms, including pain, pelvic discomfort and urinary problems. These improvements are similar to those experienced by patients who underwent hysterectomy — but without the long recovery. Significant adverse events are rare in women treated with UFE and overall adverse events are fewer — in number and severity — than in the hysterectomy group. A five-year study shows that UFE provides long-term symptom improvement in more than 70 percent of women treated compared to fibroid recurrence rates as high as 62 percent following a myomectomy. 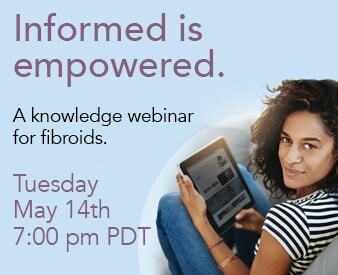 Do you have questions about fibroids and uterine fibroid embolization (UFE)? Leave a comment below.